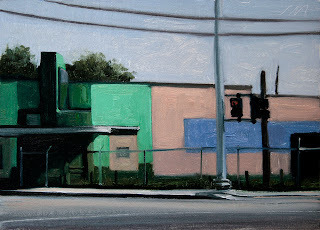 Eight Mile Road, oil on linen panel, 7"X5". The Eight Mile made famous in the movie. It is the dividing line between Detroit and the Northern Suburbs. 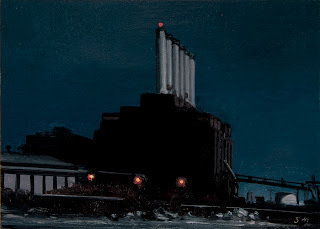 River Rouge Nocturne #2, oil on linen panel, 5"X5". Part of the vast Detroit River Rouge Steel plant on a misty winter night. 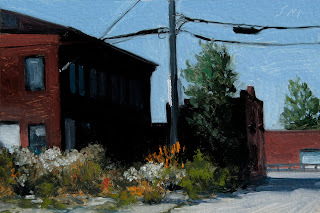 Detroit Storefront, oil on linen panel, 7"x5"
Eastside Detroit #2, oil on linen panel, 7"x5"
Nocturne in Blue, oil on panel, 7"x5"
During our nightly walk this is what greated us at the end of our street. Enjoying the last great days of summer. 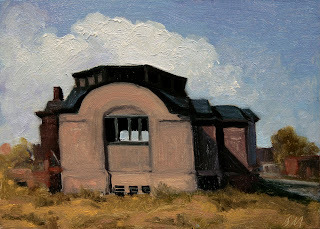 The Sunlit house, oil on linen panel, 7"x5"
Another in the Hopper like landscape of Detroit. 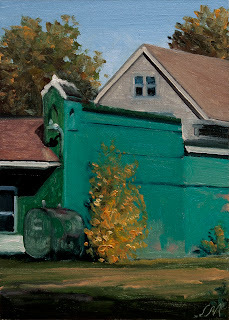 I will be adding some images to older posts of paintings that are available at the Galleries I show with. 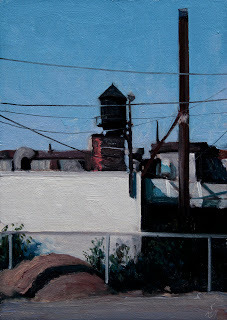 Watertank Shadows, oil on linen panel, 7"X5"
This is a B&W Detroit painting for an upcoming B&W show that opens on Oct 6, at the David Klein Gallery. 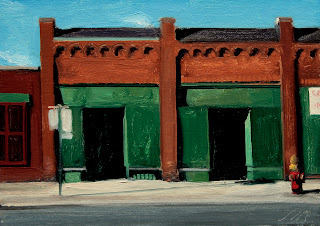 Corner Storefront Oil on linen panel about 8"X6"
Another in the continuing series of Postcards from Detroit paintings. 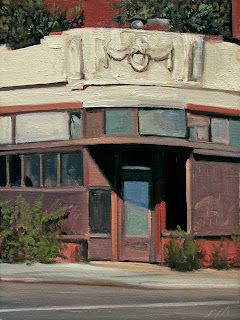 Sunlit Corner, oil on linen panel, 5"X7"
Woodward Ave Storefront, oil on linen panel, 7"X5"
Woodward is the main street in Detroit. It has many faces from affluent to abandoned. 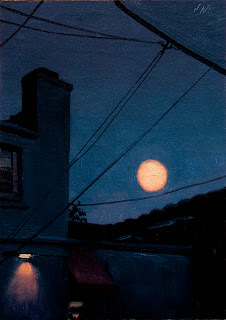 Detroit Nocturne #2, oil on linen panel, about 8"X6"
Latest in the ongoing Detroit series of paintings. 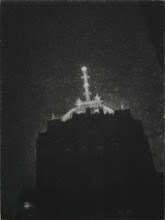 This noctune is available at the George Billis Gallery, NY. 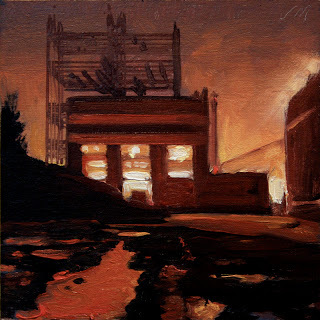 River Rouge Nocturne, oil on linen panel, 8"x6"
Another in the Detroit series, "Postcards from Detroit"
Northeast side Detroit, oil on linen panel, 5"x7"
More of the continuing series of Detroit paintings. 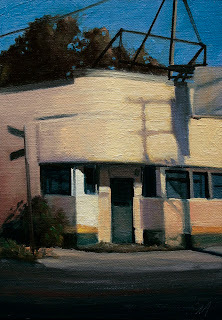 Orpheum Detail, Oil on linen canvas, 48"x40"
This painting is at the George Billis Gallery, LA. It is a detail of the neon sign on one of the great old theatres in downtown LA. 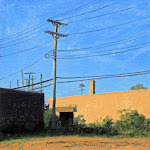 Detroit Blue, oil on linen panel, 7"x5". 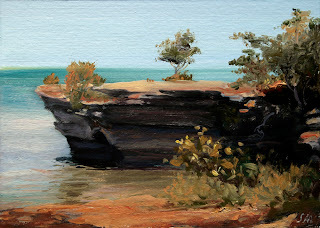 Back to the Detroit series.This is just off of Woodward Ave.
Lake Huron Shore, Oil on prepared paper, 5"x7"
This is along Lake Huron at the tip of the Thumb. Back to Detroit tomorrow. 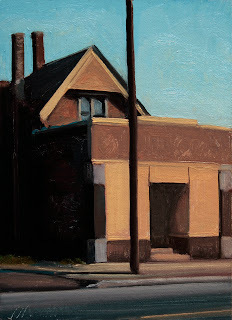 Eastside, Detroit, Oil on linen panel, 7" x5"
This little jem is on the east side of Detroit. 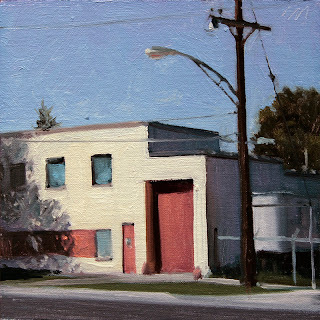 Some buildings just ask to be paintings, and this is one of them. 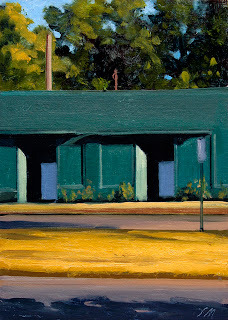 Downriver #2, oil on linen, 5"x7"
Early Morning Shadows, oil on panel, 5"x5"
oil on linen panel, 5"x7"
Corner Deli, Oil on linen, 40"x32". This is a deli that no longer exists, it is now a hip restaurant, such a loss. 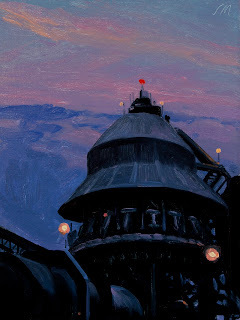 I will be listing some available Gallery painting in addition to the Daily Paintings. 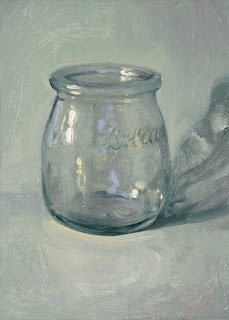 This painting is available at the George Billis Gallery NY. 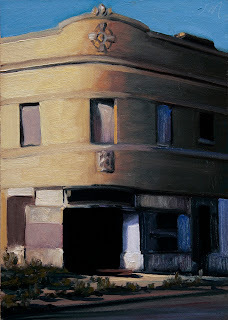 Detroit Nocturne #1, oil on linen panel, 5"x7"
Another building in Detroit that doesn't exsist any longer. Detroit has the habit of tearing down rather than fixing or restoring. I am glad I took a lot of photos of Detroit from the 80's to today. This is from a shoot taken with a good friend and artist Mark Arminski in 1987. 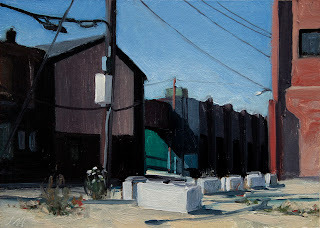 It started me doing urban landscapes. To record what was happening in our city. I am still using photos from that shoot. 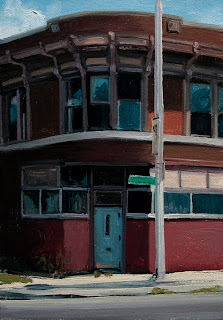 The Red Door, oil on linen panel, 5"x5" The fourth in the Detroit series. 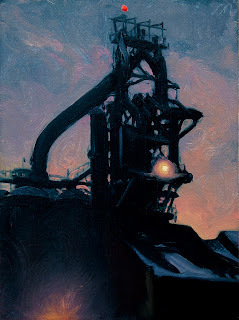 Last light, oil on linen panel, 5"x7"
Third in this series of Detroit paintings. 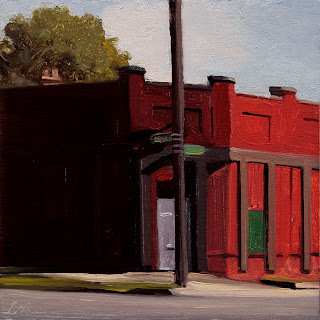 Corner Shadows, oil on linen panel, 7"x5" There are so many abandoned storefronts all over Detroit, typical of our economy but great for painting. 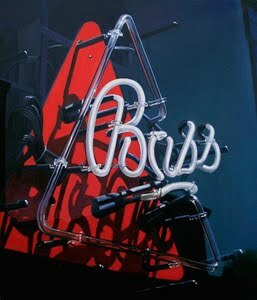 Bistro Les Amis oil on linen canvas 60"x42". A bristro in the SOHO District of New York City. 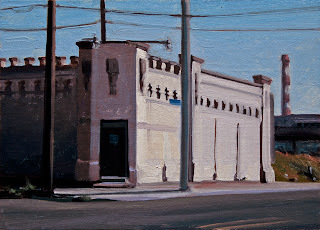 Early Sunday Morning, oil on linen panel, 5"x7" I am starting a series of paintings of Detroit. Finding beauty where I can. 70 White, Oil on linen, 42"x36".One of the larger gallery paintings I have been working on. This is one of my favorite streets in Tribeca, New York. 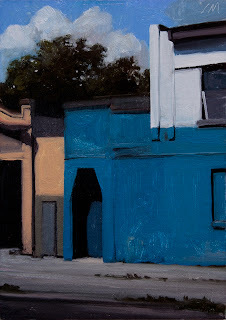 This painting is available at the David Klein Gallery. 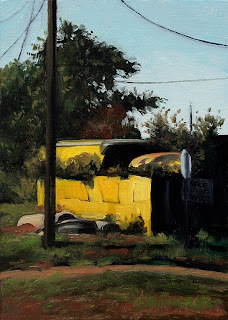 Downriver Detroit, Oil on prepared paper, 4"x6"
La laitier jar, oil on linen panel, 7"x5"
Field with Goldenrod, oil on linen panel, 5"x7"
This is in the thumb area of Michigan, We went for a drive yesterday, it was delightful weather and great scenes. I turned 61 yesterday and we had a party with all the children in our neighborhood. Cupcakes for all!